In both the semi-classical and quantum approaches to light detection, the two approaches with which we are most concerned, we treat our detectors quantum mechanically. That is, whether or not a wave or particle is incident upon one of our detectors, the detector will emit a discrete electron particle as a signal. The detector is thus necessarily dependent on the particle nature of energy and matter and as such must be treated quantum mechanically . Above: The DE2 coincidence-counting circuit. In physics, a coincidence is the almost simultaneous detection of two events. In practice coincidences will not occur simultaneously, but will occur within a certain threshold denoted by τ. Coincidence counting involves two or more detectors connected to an electronic coincidence circuit. The coincidence-counting unit we are using in our experiments is based on a field programmable gate array, which is basically a programmable logic IC. We have implemented a coincidence counting unit (CCU) on the Altera DE2 development and education board, pictured in Figure 2, with the help and guidance of Marc Beck from Whitman College. The CCU can take input from up to four detectors and has eight counters. The counters are used to count four singles counts and four arbitrary 2-, 3-, or 4-fold coincidences, which are determined by the switches on the DE2 board. The CCU has a coincidence-time resolution of less than 8 ns when pulse shortening is turned on. The nicest thing about this unit is that all we need to do is buy a preassembled development board and simply download a program onto the board. We obtained the design files from Whitman College. Jesse Lord, an undergraduate at Whitman College, was largely responsible for the programming of the CCU. The only thing that needed to be built was an adaptor box. 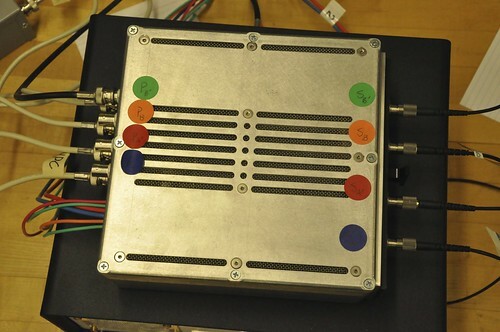 The adaptor box is a voltage divider that converts the signals outputted by our single photon detection module, which are 5V signals, to 3.3V signals. The DE2 operates on 3.3V logic, which is the reason we need to convert the pulses to 3.3V pulses. 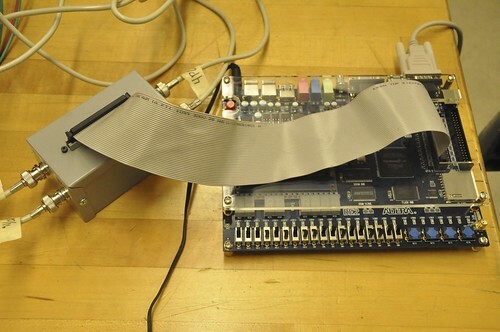 Data streams from the CCU to the computer over an RS232 serial interface (COM port). The total cost for this CCU is about $300, which is much cheaper than traditional coincidence counting equipment .